The 3-Ds have each picked a June flower to feature alongside their hats today. 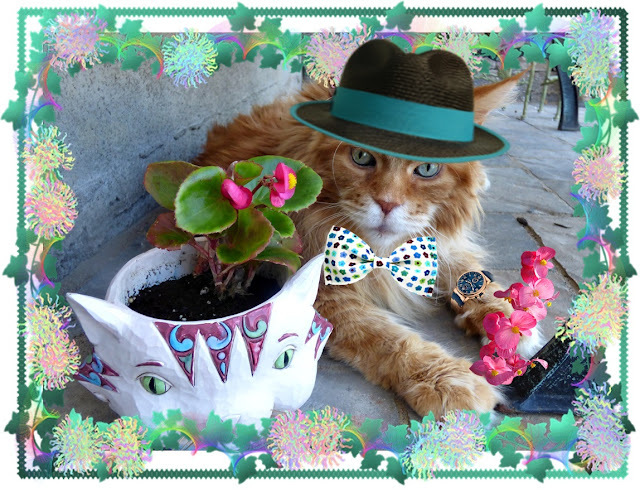 Dante's in a brown straw fedora with teal banding and a white with multi-coloured floral bowtie. And he is wearing his gold and blue Ulysse Nardin watch so he can time the photoshoot. Dante has picked a begonia to highlight today, which he is holding between his two paws. He is also posing with a hot pink begonia planted in a garden pot shaped like a cat's face. Now that time's up, he says to me "Be Gone Yoo!" 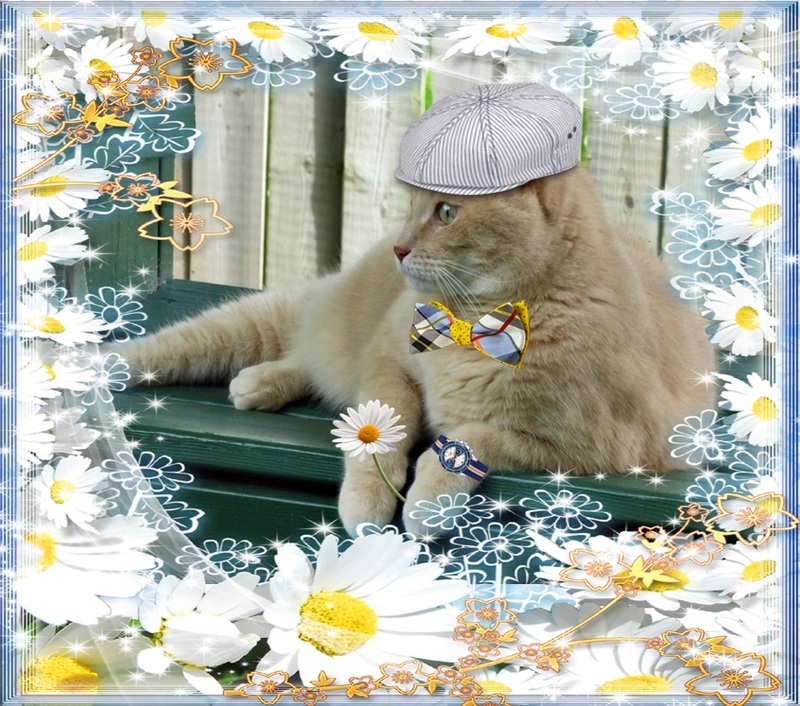 Dylan's looking fresh as a daisy in his white-and-blue striped Gatsby cap and blue, white, yellow and red plaid bowtie. His Tudor watch in blue, white and yellow also coordinates quite nicely. He is holding his flower of choice -- a daisy, of course. "Cuz dese days I is all in a daze", says he. "Efurry morning I sings: "Daisy, Daisy, give me yoor answer dew!" Domino is devastatingly divine in her hot pink flowered fascinator with pearl and white sapphire adornment. She is wearing a coordinating hot pink heart necklace with pearl on a silver chain. 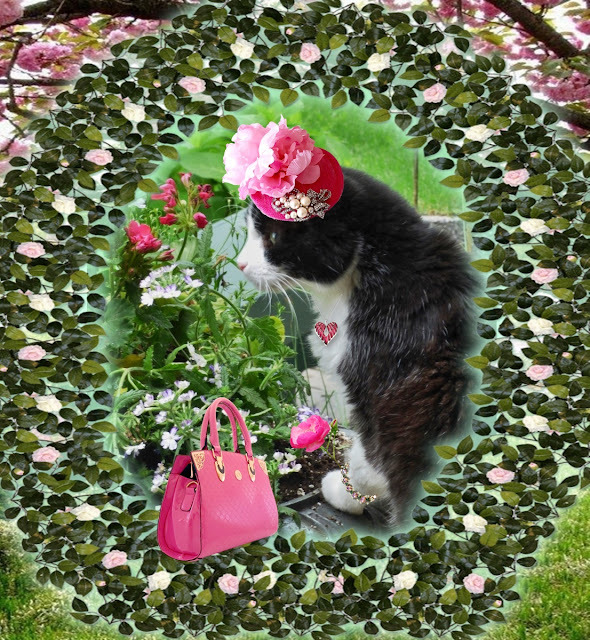 Around her wrist is a bracelet of pink and green gems, and her purse of pink with brass details is a purrfect pairing. Purrhaps you can tell from Domino's surroundings that she has a prefurence for roses and she's even holding one between her 'toeses'! "An' dere's nuttin bettah dan a rose wif a liddle glittah!" remarks she (as spokespurrson for the Glitterati). Y'all are amazing and you've always got the tip-top fashion thing going on!